The Kitchen ... cozy seating groups are placed throughout and divided by tall, bronzed screens. Two new venues that recently opened at the Kempinksi Al Mouj in Muscat were designed to echo the essence of Oman – both past and present. HBA Dubai elaborates on the concept behind them. 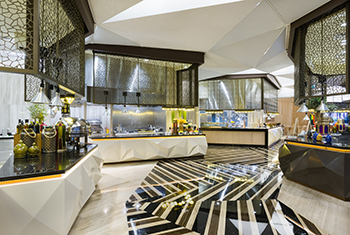 Offering both indoor and outdoor settings, the two venues – The Kitchen, an all-day-dining restaurant and Zale Beach Club – were completed in May for Oman Hospitality Company (OHC). Other stakeholders in the project included S&T Interiors and Contracting as the fit-out contractor, and WSP as the project management company. The beach club features bamboo and rope ceilings and arabesque lanterns. 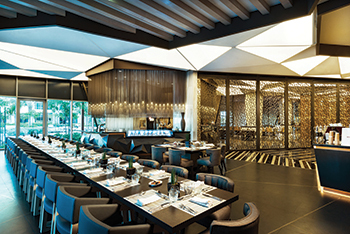 Following on and expanding on OHC’s brief to create a restaurant that will offer a wide culinary range – indoors and under the open sky, HBA Dubai embarked on a concept that aims to provide diners a journey through ‘the Boulevard of Delights’, Sarah Hamid, project director at HBA Dubai, tells Gulf Construction. The Kitchen, a contemporary restaurant has been designed by HBA Dubai as a faceted interpretation of Oman’s landscapes, textures and palette. The facility spreads over 220 sq m of indoor and 140 sq m of outdoor space. “The Kitchen’s concept aims at providing a choice for one’s path – from sitting indoors or under the open sky, to the heart of the kitchen and consuming foods from around the world and then learning how to create them,” she says. The guest experience starts by leading diners down a deconstructed path that gently guides them to explore culinary delights. Through this faceted path, the guests will discover the various staging counters, angular in form and topped with a travertine-effect composite. Cozy seating groups are playfully placed throughout and divided by tall, bronzed screens leading to outdoor seating areas. Zale ... a family beach club by day and a nightclub after sunset. Throughout the restaurant and café, a combination of seating styles is found for the diner to choose from; stools, dining chairs and banquette seating feature rich textures and tones rather than contrast, adding a complementary visual layer to the concept of exploration and discovery. An earthy blend of Omani hues, delineated marble floors and walls, honed and polished textures juxtaposed with a strong presence of deep warm metals all create a strong sensory experience unlike any other, T’Kint says. Working around a demanding serving schedule, HBA designers had to create an area that could provide a buffet during breakfast and à la carte service for lunch and dinner for 250 seats. The space had to provide a direct link to the cafe with ease of separation, allowing for breakfast spillover and dining outlets for the rest of the day. The buffet units were designed to be flexible and adaptable – during the non-breakfast hours, they are used as display or dining tables. For example, the Italian section can be transformed into the “Chef’s Kitchen”, offering counter seating and potential for a cooking class. The Kitchen ... the guest experience starts by leading diners down a deconstructed path that gently guides them to explore culinary delights. Beyond the lively Eastern/Asian stations, also central to “the path”, HBA created a semi-private dining zone enclosed with metal sheer drapes. As diners continues down the path, they’re led through tall bronzed pivoting screens onto the café, the spill-over during breakfast, that later transforms into a moody space. All the furniture and decorative materials were custom manufactured and sourced. The aim was to employ as much local craftsmanship and manufacturing, and natural resources, according to Hamid. Commenting on the challenges of the project, she says: “The main challenge we faced was during the coordination phase. As the ceiling design intent was angular, with three-dimensional faceting, we had to consider all the MEP (mechanical, electrical and plumbing) components, ventilation and stretch ceiling lighting. Each angle had to be studied and positioned in a way that it did not obstruct any of the MEP equipment and ductwork,” she explains. HBA Dubai was given a flexible brief to design the Zale Beach Club, a venue that would be a family beach club by day and transform into a nightclub at sunset. Offering multicultural-inspired cuisine, Zale offers seating for 70 people indoors and 185 outdoors, and features an indoor upper floor VIP area for private groups. “The Zale Beach Club at the Kempinksi Al Mouj greets guests with ornately carved wood and brass-studded doors. A warm welcome, reminiscent of the deep Zanzibari heritage and the Omani seafaring legacy, has been beautifully preserved,” says Hamid. 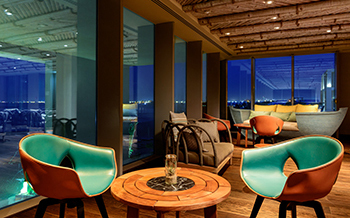 The club and lounge draws the visitor into a space that tells a story of an early Omani coastal trading town, where covered and open-air spaces are interlaced and offer an assortment of experiences – using loungers, cabanas, sunken fire-pit seating, and visually layered zones. 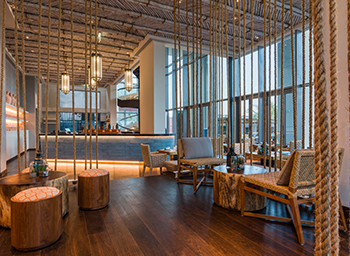 Inspired by the materials that Omani sailors traded for centuries with India, China and the coast of East Africa, the beach club features bamboo and rope ceilings, elaborate arabesque suspended lanterns, solid teak furniture, antiqued clay urns and coconut palm fibre woven seating. The pastel fabrics and subtle tribal patterns provide a perfect palette for an ethnic urban scene. The seating and casegoods were acquired from Kettal, Riva Spa, Unopiu and Walters Wickers; decorative lighting was from Beacon Decor & Light; while the bathroom fittings are by Kohler.